Secluded cabin in the woods of Catskills. Hilltop home surrounded by trees. Calling my outdoors enthusiast. : salt water pool, tennis court, hiking, Fire pit with Adirondack chairs overlooking large pine and oak trees. Breathe in the fresh air and get ready to relax and decompress. Recently updated cabin with new kitchen and bathroom featuring all the amenities you will need for your getaway. Wood burning stove for those cold days, high ceilings and lots of natural light. Peaceful cabin perfect for quiet reading and inspiration for painting and writing. House has access to free WiFi, Amazon stick and HBO access. Two bedrooms feature queen size beds. Loft space has a comfortable full bed. Located only 2 hours from New York City in thriving Kerhonkson with highly rated restaurants, breathtaking hiking trails and more. Only 20 minutes from Woodstock and short ride to skiing at Sawkill and Holiday Mountain Ski & Fun. Only 45 minutes from Resort World Catskills. House has the essentials. Clean towels and linen provided along with shampoo and body wash. Sorry NO PETS. I am allergic to both cats and most dogs. Please treat our home with care and respect. If you have a special event in mind that you would like to host at our property please reach out to me directly and we can discuss ways and means to accommodate it. Wood burning stove closed during from May 15th to October 20th. PLEASE NOTE: The pool is open from Memorial Weekend until October 15th. There is a fence around the pool for child safety. Please note that all members of guest party must sign pool waiver. Please only turn on pool heater when in use and remember to shut off pool heater. The house runs on a septic system. Please dispose of all baby wipes, paper towels sanitary products and food scraps in the garbage instead of in the toilets. Bathroom is equipped with disposable sanitary bags. All damages to the home will result in a cost to replace and/or repair. Tenant must report if any damages are present at the property within two hours of arrival. If there is no report of any damage, tenant assumes responsibility for damages incurred during the rental period. Furniture, electronics, and artwork are not to be moved. Premises left dirtier than what is considered normal will result in additional cleaning costs. We provide two sets of keys. Both keys must be returned to the lockbox at end of your stay. No Smoking is allowed inside the house. Smoking inside the house results in the loss of entire Security Deposit. Smoking is permitted outside. There is a $50 charge for leaving cigarette butts on the property. Please respect the surrounding property owners. Guest have access to the entire house. Enjoy the in-ground heated salt pool, large deck with lounge chairs and table, tennis court, basketball court and more. There is a fence around the pool for child safety. Please note the all members of guest party most sign pool waiver. My contact information will be provided including phone number and email address. Easy house access information will be provided. Garbage is limited to four bags maximum per stay. Residing primarily in Brooklyn with my husband and our sweet (soon to be 3-year-old) baby girl. We love to travel, enjoy tasty food, wine vineyards, exploring new places and lots of colors! Game of Thrones enthusiast. I love a good glass of wine and a thought provoking scifi flick. ~ If you give love, respect to others then surely you will receive love and respect from others. Just 90 miles north of New York City, Kerhonkson has something for all. Only 20 minutes from Woodstock and short ride to skiing at Sawkill and Holiday Mountain Ski & Fun. Explore the trails of Minnewaska State Park and the Mohonk Preserve. Rock climb at the Gunks cliffs just minutes away. Swim at Split Rock. Spend a spa day at The Mohonk Mountain House just a short 15 minute ride. There’s a big Pick-your-own farm called Kelders Farm just down the road that is open year round. Hay rides, petting zoo and giant trampoline for the kiddies. There are local wineries, breweries, farmer's markets, meat, and produce shops within a 15 mile range. Westwind Orchard, Arrowood Brewery, New Paltz Brewery, Raven Wood and more. Enjoy antiques, historic towns, and cruises. Private pool , private tennis court, private hiking trail, pond and Mill brook. My boyfriend, his daughter and I had a wonderful stay. The house is charming with a vibrant decor full of fun surprises, well appointed kitchen, good size bedrooms, and very clean. We even enjoyed the books. 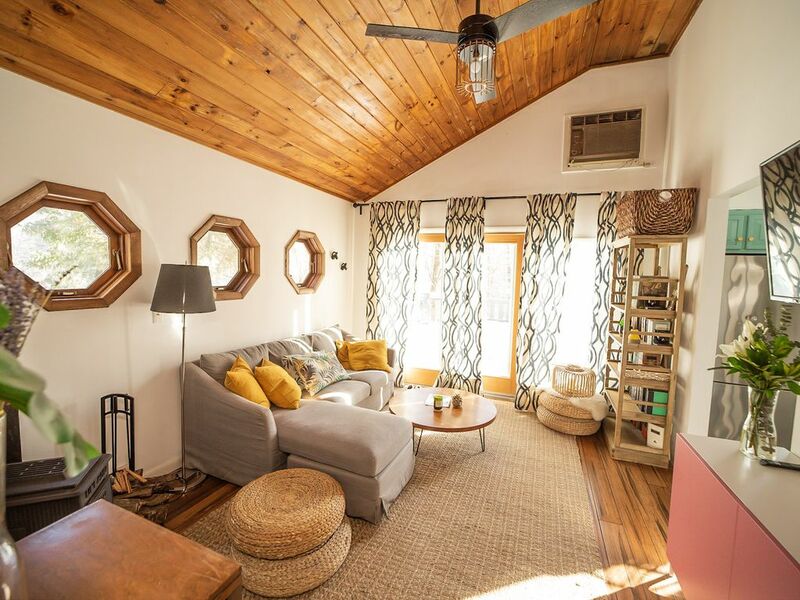 The location is beautiful and accessible to all that you would want o explore in the Catskills. Our stay was during the winter but it is easy to imagine swimming in the pool and playing tennis in the summer. We look forward to our next visit.